The film opened with the bombing of the 5th Avenue downtown New York City Bonwit Teller department store in the summertime. A phone call to Inspector Walter Cobb (Larry Bryggman) from a vengefully-mad bomber/terrorist named "Simon" (Jeremy Irons), informed him that he was responsible for the store bombing. He specifically asked for Lt. John McClane (Bruce Willis), and was told the cop was on suspension from the NYPD. He demanded to play a game of "Simon Says," instructing McClane what to do: "Non compliance will result in a penalty... Another big bang in a very public place." McClane's first "Simon Says" task to prevent another catastrophe, an hour later, was to go to the corner of 138th Street and Amsterdam in Harlem. Cobb, Det. Connie Kowalski (Colleen Camp), and Det. Joe Lambert (Graham Greene) located McClane, on the verge of becoming a full-fledged alcoholic after separating from his wife, and drove him in an NYPD van to Harlem. A stripped-down McClane wore a sandwich board (reading: "I HATE NIGGERS" in bright red handwritten letters) as he walked along the street. Upstanding Harlem shopowner Zeus Carver (Samuel L. Jackson) reluctantly rescued him from certain harm ("You are about to have a very bad day"), when he grabbed McClane's gun (taped to his back) and held off angry young Harlem residents, although he suffered a knife-slashed arm. They commandeered a taxi to the precinct office. A police psychologist described how the "Simon Says" terrorist had a "megalomaniacal personality with possible paranoid schizophrenic..." - he sought personal revenge and was directing his rage specifically upon McClane. A bomb expert displayed one of the terrorist's bombs found in a briefcase in a playground in Chinatown - "cutting edge" stuff, a "binary liquid...like epoxy" that when mixed became volatile. Two thousand pounds of the bomb substance had been stolen from Livermore Labs over the previous weekend. [In the earlier scene in the van, it was mentioned that 14 dump trucks were stolen from a yard in Staten Island.] They were interrupted by "Simon's" phone call to the precinct - the German-speaking, stuttering terrorist demanded to speak to McClane and "ebony samaritan" Zeus, suggesting that he "join the game" too. Their next task was to go to the subway station at 72nd Street and Broadway, where they would receive further instructions on a payphone there in 15 minutes. Zeus was reluctant to join McClane as a team: "I ain't your partner, I ain't your neighbor, your brother, or your friend. I'm your total stranger." The phone call from the nursery-rhyming terrorist forced the two to play the villain's version of 'Simon Says' and solve riddles to prevent further catastrophes throughout the city. The first riddle regarding a rhyme about one man going to St. Ives needed to be solved in 30 seconds. Zeus figured out the answer and they replied 10 seconds late, but it was a false alarm. They were then told the # 3 subway train was about to arrive in the station - and were instructed to hurry to the Wall Street subway station 90 blocks away in only 30 minutes: "Simon says get to the pay phone next to the news kiosk in Wall Street station by 10:20 or the number three train and its passengers vaporize." After seizing a taxi for police business, they hurriedly drove the distance by short-cutting through Central Park - literally - to avoid the busy traffic. Halfway there, McClane bolted from the taxi to board the # 3 subway train ("I'm gonna get that bomb"), while he told Zeus to continue driving on city streets ("Go now! Drive! Get to that phone booth by 10:20"). When the train pulled away, McClane raced back to the street, opened up a grating, and jumped atop the moving train. He found the ticking bomb in a yellow police call box onboard the train, at 10:20 - the same time that Zeus arrived at the Wall Street station platform's payphone, where he was accosted by a nervous, gun-wielding cop. When he answered "Simon's" phone call without McClane present, the terrorist reprimanded: "The rules applied to both of you. I'm afraid this is non-compliance. Goodbye." Just then, the # 3 train with McClane onboard (carrying the armed bomb) tripped the detonator on the tracks at the Wall Street station - triggering the bomb. The bomb exploded after being thrown out the window of the moving train. The train derailed and tore through the station as people ducked and fled the scene. There were some injuries, but no fatalities. At the scene, FBI agents and other informants told McClane, Zeus and the police that "Simon" was actually migraine-suffering Peter Kreig, an ex-East German colonel who had run an infiltration sabotage unit: "Peter Kreig was born Simon Peter Gruber. He's Hans Gruber's brother" - the psychopathic brother of terrorist Hans Gruber (Alan Rickman), whom McClane killed at the Nakatomi Towers in LA in the first film set in 1988. Intent on seeking revenge with the various bombings, he was back with German mercenaries, including Hungarian army explosives expert and partner Mathias Targo (Nicholas Wyman), who was working as a freelance terrorist for the Iranians. As they talked, Gruber phoned with information about 2,400 pounds of explosives planted in one of the 1,446 schools in greater New York, and set to explode at 3:00 pm: "Simon says, if you attempt to evacuate schools, the bomb will be detonated by radio" - "unless John McClane and his new best friend complete the tasks I set them." The pair were told about a "payphone beyond hope, at Tompkins Square Park. 20 minutes, go by foot. No rush. If you're really clever, you'll learn the location of the bomb and the code to disarm it." They were warned that the bomb's radio-activated detonator responded to police and FBI frequencies. McClane and Zeus had a little over three hours until the bomb was set to explode, aided by police and other city officials who were engaged in a massive search of every school coordinated through ordinary telephones - while avoiding using police and FBI radio frequencies. Blonde-hair dyed Gruber watched from atop a building with binoculars, affirming: "They bought it. You can begin...Hook, line and sinker" - his plan was to deplete the Wall Street area of police. Gruber's major objective was to seize $140 billion dollars worth of gold bullion from the vaults of New York's Federal Reserve Bank ("Ten times what's in Kentucky. Fort Knox"). Detective Ricky Walsh (Anthony Peck) noticed, to his surprise, that 14 dump trucks were hurriedly brought in to assess the subway station damage - [In fact, they were the stolen trucks from Staten Island to be used to haul away the gold bullion and take it to an awaiting tanker]. Gruber impersonated a well-dressed City Engineer's office employee to orchestrate the major theft, helped by Walsh's officers. He then pretended to be Mr. Vanderfluge, a businessman requesting a major currency exchange, to gain entry to the Federal Reserve Bank. Security forces within the bank were quickly neutralized and killed as Gruber directed heavy equipment to drill through the underground bank wall, to gain access to the bullion vaults, and to scoop up the gold bars and deposit them in the dump trucks. Meanwhile, McClane and Zeus ran into Tompkins Square Park, beyond a statue marked Hope, where McClane answered a ringing payphone - Gruber asked: "What has four legs and is always ready to travel?" The Elephant's Trunk joke led them to a nearby elephant fountain/statue where they found another briefcase. When it was opened, a message read: "I am a bomb. You have just armed me". Gruber phoned with their new task: Using a five gallon and three gallon jug on the fountain, they were to come up with exactly 4 gallons, and place it on the scale, in order to deactivate the bomb, within five minutes. The two argued about their own racist attitudes, as Zeus screamed at McClane: "I don't like you because you're gonna get me killed." They figured out the task and disarmed the bomb with only a few seconds remaining. Gruber congratulated them, and reminded them that they had two hours and 47 minutes to find the school bomb. There was an envelope under the rim of the fountain, suggesting a trip and this complexing question: "What is 21 out of 42?" They were instructed to go to the home team dugout at Yankee Stadium, as McClane deduced: "It's a wild goose chase is what it is" and realized that they (and all the city's police) had been deliberately sent away from downtown's Wall Street area. The duo borrowed bikes from two youths and returned to the unguarded Wall Street area, where dump trucks had already pulled out. Gruber's partner Mathias Targo urged him to eliminate McClane: "Stop toying with him and kill him now." Inside the Federal Reserve Bank, McClane was tipped off to the scheme when he saw "Detective Otto" wearing the 6991 badge of fallen officer Ricky Walsh, and was able to survive an elevator ride with Gruber's uniformed mercenary henchmen. McClane and Zeus discovered the vault's theft, as McClane said: "I should've seen it comin' a mile away. This was never about revenge. It's about a goddamn heist!" They followed the trail of the heist's dump trucks north on the FDR highway, first in a borrowed Yugo and then a hijacked luxury car. Gruber called radio DJ Elvis Duran to broadcast to the entire city what the police were doing throughout the metropolitan area: "There's a bomb in a school....Only they don't know which one so they're searching all of them." A mass panic was created when worried parents jammed switchboards calling 911, crippling police communications over phone lines. McClane intercepted a dump truck, finding out that it was bound for the water aqueduct - the likely destination of dump trucks in the area. He entered the underground viaduct in the truck to pursue the other ones carrying gold bullion (each truck was carrying $13 billion, according to Gruber), while he sent Zeus to Yankee Stadium. He then killed two of Gruber's henchmen in the "rear guard" truck, and took over the wheel to pursue the terrorists. At Yankee Stadium, Zeus found a small puzzle on one of the chairs behind the dugout - a message was taped on the back: "GAME OVER" but one of Gruber's snipers was instructed by radio not to kill him, but to follow him - to presumably find the whereabouts of McClane. The riddle was solved: the 21st president out of 42 was Chester A. Arthur, the name of one of NYC's elementary schools - where the bomb was planted. Cobb directed his police force to converge on the school to locate the bomb (found in a recently-delivered refrigerator). At the final moment before the bomb was defused with about two minutes left, the school was entirely evacuated (except for one classroom where four children had snuck in to play cards), and a tense rescue attempt was made to save them - although the bomb was a fake. When all of the dump trucks had reached the dam and outer exit, Gruber ordered the aqueduct flooded ("We blow the dam, we drown him"), although Mathias was angered with Gruber for toying with McClane too long: "You jeopardized the mission and the contract." The dam burst from the explosion, unleashing a torrent of water at McClane, who steered his truck in the opposite direction, and then climbed atop his truck to grab an escape hatch ladder on the roof of the tunnel to avoid being drowned. Zeus happened to be driving by and saw McClane ejected in a waterspout onto the ground ("You gotta helluva way of flaggin' somebody down"). As gunshots rang out from the thugs following them from Yankee Stadium, they engaged in a driving-shootout that left both cars wrecked. The dead driver of their pursuit vehicle had 10 quarters in his pocket - McClane guessed they were for the toll bridge - where the other dump trucks had already crossed, arrived and unloaded their cargo onto a departing tanker. The two found their way onto the deck of the tanker as it sailed under the bridge by dangling and dropping from a winched cable. A few of the Germans (including Mathias) onboard the tanker discovered that the containers held only pieces of scrap metal, not gold bullion bars. Zeus was caught by Gruber and wounded in the leg, while McClane fought below deck with Mathias. McClane unsuccessfully alerted the Bridgeport Coast Guard when he was put on hold, and then was confronted by Gruber - McClane realized: "There was never any bomb in the school, was there?" Gruber affirmed McClane's assumption, and admitted: "The real bomb is on this ship" - as McClane and Zeus were lowered into the tanker handcuffed to the explosive. In a recording transmitted to the Coast Guard, Gruber described how the contents of the tanker taken from the Federal Reserve Bank (the gold bullion bars upon which the economy was built) was to "be redistributed by explosive across the bottom of the Long Island Sound," in order to prevent the West from stealing the wealth of the world and to create a major economic catastrophe: "Today, we will level the playing field." Gruber told the two doomed men this time: "No code, no riddle, no fancy little countdown." But Mathias knew the truth about Gruber's plan - that the containers were filled with scrap metal. He was murdered by Katya (Sam Phillips), Mathias' former mistress now in league with Gruber. The terrorist's scheme was only to make people believe that he was blowing up billions of dollars of gold. In fact, his last words to McClane were that his sole interest wasn't revenge for his brother's death - he didn't even like his brother. However, eliminating his brother's murderer in his plan was an extra bonus: "Life has its little bonuses." Gruber tossed McClane (with an all-day hangover headache) an aspirin bottle as his last gesture. Zeus was able to pick the lock on McClane's handcuffs with a splinter from the cable, and after McClane released Zeus' cuffs, the two escaped moments before the bomb obliterated the tanker. As they were treated for their injuries, McClane told Cobb that dredging Long Island Sound wasn't necessary: "There's no gold out there." As McClane phoned his estranged wife Holly, calling collect with a quarter given to him by Zeus, he popped an aspirin, and then noticed the writing on the bottle: "Nord Des Lignes 93S104" -- it was purchased in French Canada at "North of the Border - Quebec's Largest Truckstop" - Gruber's destination. The film's climax was set in Canada, where Gruber celebrated as the gold bars arrived in trucks. He toasted with champagne to his men: "Yesterday, we were an army with no country. Tomorrow, we have to decide which country we want to buy. And remember, this is all due to the gullibility of the New York Police Department. As they prepared to leave, police helicopters arrived overhead - carrying McClane and Zeus, along with an assembled force of police cars. Gruber was angered by their appearance, and reached for his machine gun: "I have something personal to finish." Katya piloted a helicopter with Gruber firing his machine gun at McClane's and Zeus' copter - forcing them to make an emergency landing. Gruber was killed when his helicopter descended under electrical power wires while trying to machine-gun McClane who had attempted to create a diversion - as Gruber smiled at McClane before firing, his copter's rotor blades were hit by a cable box and the wires dislodged by McClane with his last two bullets ("Say hello to your brother"), electrocuting them and causing their copter to explode in a fireball when it crashed into a large power pole. 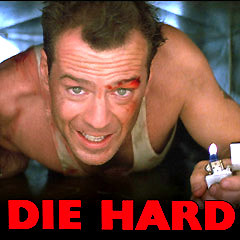 McClane surveyed the damage and uttered his famous line: "Yippie-ki-yay, motherf--ker!" But he realized he had left his wife "hanging on hold" during his phone call, and he worried: "She's gonna be pissed...She's a very stubborn woman." From a production budget of approximately $90 million, the film's box-office was $100 million (domestic) and $361 million (worldwide). Unfortuitously, the film opened only a month after the Oklahoma City bombing, resembling real-life. Universally, this was considered the weakest of the series.